I stopped by the tail end of the Friends of the Arlington Library book sale today and came away with six things: three Christmas items (two detective stories, including one whose author was, until recently, a mystery of its own, and a dvd of Emmett Otter’s Jug Band Christmas), a favorite childhood title, The Saturdays; a book by a favorite author (Fannie Flagg) that I hadn’t yet read; and a children’s book called A Book Dragon, which I bought solely for the title. The total bill for the bunch came to $2.25. Not a bad haul, eh? 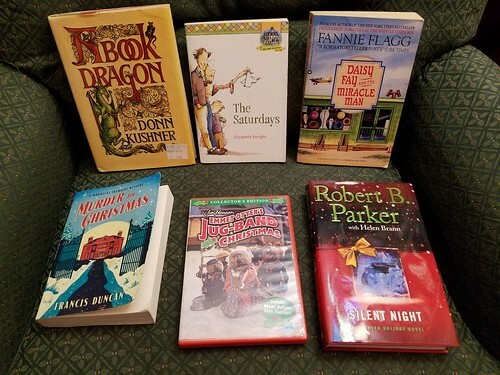 Do you like to partake of library book sales, and, if so, do you have any favorite finds? I think you got a good deal. Not a bad haul at all! Always great to find book deal!